Hello BiggerPocketeers! You're Going to Want to Read This! ForumsArrowQuestions About BiggerPockets and Official Site AnnouncementsArrowHello BiggerPocketeers! You're Going to Want to Read This! The past few months, we’ve been hard at work at a few REALLY neat features on BiggerPockets that will help you connect better, learn more, and achieve financial freedom even faster. We’ll be rolling these new features out over the next several months (and some have already been launched, such as the brand-new “Rehab Estimation Calculator,” which is going to help a LOT of people), so keep an eye out. On Wednesday, November 15th, BiggerPockets is doing something we haven’t done in a while: We are changing our prices to better fit the new features. Most of our community will be unaffected; anyone who upgrades their account before Wednesday, November 15th OR is currently a Plus or Pro member will be grandfathered into the old prices and will continue to have access to all the features they’ve always had access to. We announced this in our blog last week, but wanted to make sure those of you who primarily spend your time in the forums saw this announcement too. I want to reiterate, if you are already a Plus or Pro member (or upgrade before November 15), your pricing does not change. You will continue to pay current prices for as long as your membership is current. Yes!!! Hello, Mindy, this is the article that convinced me to go Pro! Thank you, Mindy, Josh, Scott (Buy Scott's book "Set For Life"! ), Brandon, and all BP Nations staff! 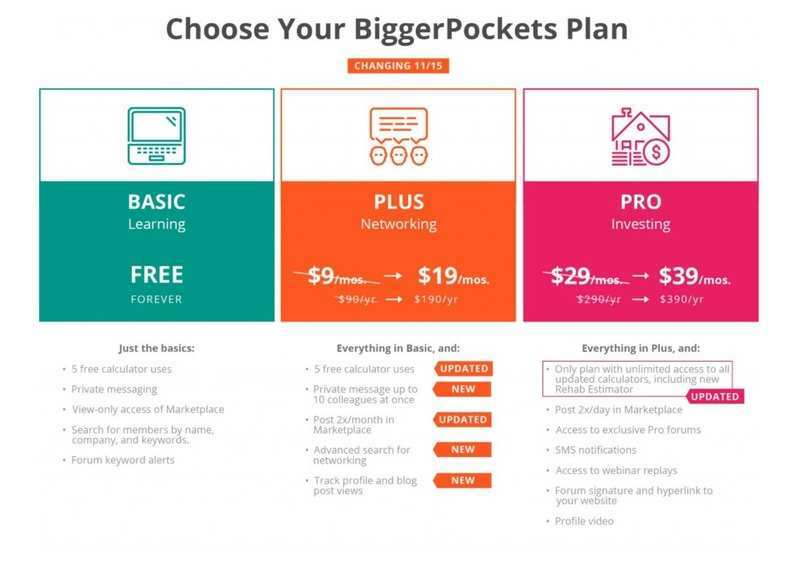 BiggerPockets "Pro" is a brilliant investment that will yield much profit for many years to come. @Jared Zanon , you get the best of both worlds. Current unlimited calculator uses PLUS the new messaging abilities and the ability to track profile and blog post views. I am new and have been thinking of becoming a member, whats the difference between pro and plus? This article also convinced me to go pro. Honestly, I was just dabbling in BP until I saw this, and took the jump. Does the report download option come with the plus membership or just pro? Thanks! @Justin Madick , downloading reports is only a Pro feature. Pro only. Worth it! Go Pro! Thanks for quick the response! Would signing up for Plus now lock in the Pro pricing too? I don't quite need Pro yet, however Plus could be useful. If I got plus today, would i be able to switch later on for 290 to pro? or would I lose my grandfather pricing at that point? Hi @Mark B. . You will be grandfathered into the membership level you choose, so future upgrades will be billed at the current price at the time of upgrade. I am not trying to be a naysayer. I just need to be sold on this Pro thing. Im trying to figure if it is worth almost $300 because I sure won`t buy it at $400. The new rehab cost calculator seems like something that can really easily be done in Excel. More so than the other calculators even. I've created excel calculators for flips and rentals that output a nice, pretty PDF for me already and they do it in seconds. No pages to load. No downloading anything. So, why should I buy pro? Or is it more for people that aren't very experienced in Excel so they have a way to calculate everything? I don't see any reason to use the marketplace, personally. I just plan on doing flips. I already am able to network quite well in the free account. I have DropBox and Google Drive for file storage. So, sell me. I just became a Pro Member, my first post as a Pro!!! If anyone is hesitant, as the famous Nike Slogan would say "Just do it"
I figured I will end up doing at some point any way, better to do it now and save some $$$. I just spend 15 minutes going over my new features, I have no buyers remorse it is wort it. Smart move, @Raul R. ! Brilliant decision and welcome to "Pro"! Smart move, @Raul R.! Brilliant decision and welcome to "Pro"! Thanks Daniel.. I will take advantage of any tools I have available, BiggerPockets is a great tool to have for all Real Estate Investors..
As a Pro member, you have access to the Pro-Only webinar replay room and the Pro-Only forum. You can message up to 10 people at a time, and track who has viewed your profile, something our Director of Ops uses to connect with anyone who has checked him out, in order to grow his network. The Marketplace Forum is the only forum where advertising is allowed, and while every member can view the Marketplace Forum, only Plus or Pro members can post in that forum. We consider looking for or offering products, properties, services, loans, courses and self promotion to be advertising. Wow, Mindy. One dollar a day is a steal for all that. And Locked in for life!? I just went BP "PRO".....and yes the "sale" and time limit pushed me over. I've been wanting to go PRO for a while and waiting for that right sale. I'm glad to fork over some money to the BEST real estate site in the world! Also, looking to strengthen my networking and use the Marketplace too. Seems like a marketing tactic to get more people to sign up. Pro membership is great for people who make a living out of real estate but jacking up the prices might just push people away from getting a membership. If you're still here, a member is asking for a discount code. Is there still a code available ? This post and the email update was very helpful...I was hesitate but I absolutely see the value in the pro memebership...and saving money is always a good thing. Turned "Pro" on Monday...and just the access to the podcasts and webinar replays has been soooo incredible...GO PRO!!! !